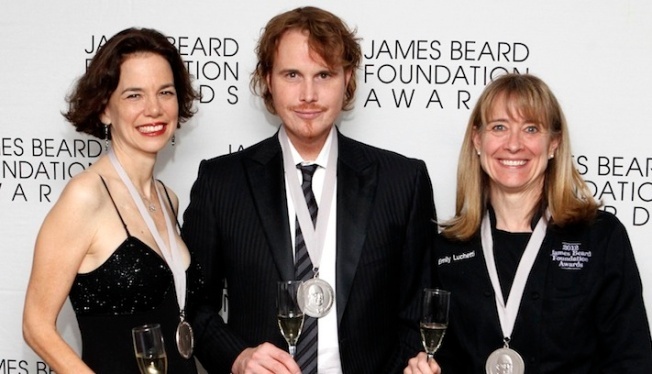 Dana Cowan, Grant Achatz and Emily Luchetti at the James Beard Foundation Awards. Chicago is adding another jewel to its culinary crown. After 24 years in New York City, the James Beard Foundation awards ceremony is moving to Chicago next year. It's more proof that Chicago is home to one of the country's hottest restaurant scenes. The James Beard Foundation is based in New York and honors the nation's best chefs and restaurants. Several cities had sought to host the awards, but the foundation said Chicago's offer of marketing and sponsorship support was too good to turn down. The James Beard awards have always been held in New York since the event began in 1990. Beard, considered the dean of American cooking, died in 1985. The next awards ceremony will be held at the Lyric Opera of Chicago on May 4, 2015.